Thanks for sharing your talent with us! 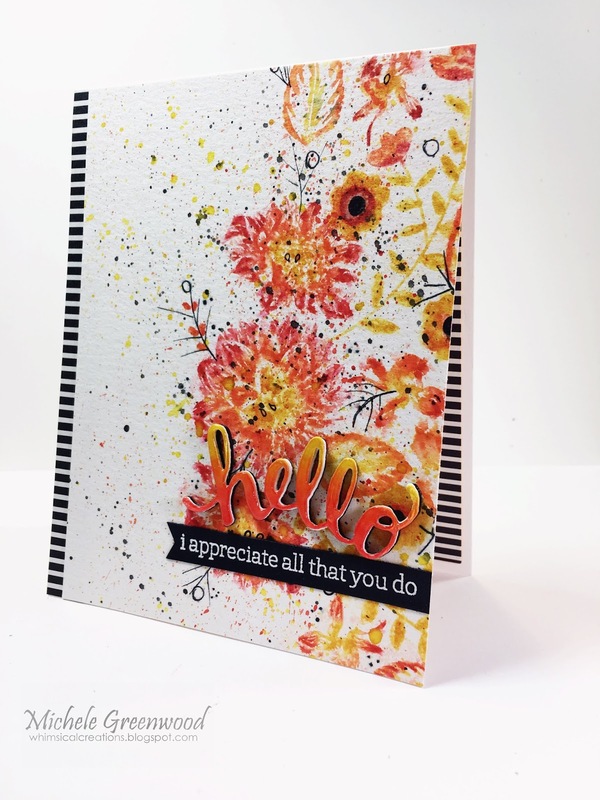 Great card – the flowers and splatters are perfectly placed. What a great fun thing to do! Maybe when I grow up (I am already 60 tho) I will be able to play in the craft world for more than 20 minutes here and there! Like the wonderful artsy look of this. Like the b&w striping edge. Wow the details are amazing! What a beautiful card. Oh my goodness–what a treasure! Your card is an artistic masterpiece–so beautiful! Wow! Michele, your card is gorgeous and stunning. Love the colorful artistic background. Beautiful CASEd card, Michele. Love the vibrant colours and how you combined stamp sets. Oh, I really love that beautiful design and ink splatter effect! Beautiful stamping and die cut sentiment. Stunning card as your finale to what has been an array of amazing creativity throughout your role here! Thank you for sharing your talents with us! Great case of the card! Love the hand-drawn black accents you put on it! Pretty card! I love the black details you added! They really stand out with the b&w striped edging! Great improvising using the Distress pads too! Beautiful card. Love the warm feel of it. Lovely card. I like the hand drawn black details you added. Beautiful card. Best of luck to you on your next creative adventure. Beautiful card!! The black details are perfect! thank you for sharing. Beautiful card; I love how the "fuzzy" spritzed distress ink images are balanced by the crisp black elements. bye, Michele, this is a great last card–beautiful! Wow this is so pretty and so elegant. What a cool burst of color! Beautiful card and clever design.